Six Nations lacrosse teams have had their share of accomplishments over the years, but the way things are shaping up, this could turn out to be the most successful season ever for squads from the Ontario-based Indigenous community. That’s because all five of the Junior and Senior clubs that Six Nations has in the Ontario Lacrosse Association (OLA) are sitting atop the standings in their respective leagues. The Six Nations Chiefs, a Senior A club, is sporting a perfect 5-0 mark in its OLA-sanctioned league called Major Series Lacrosse. This league features many of the world’s top box lacrosse players who also play the sport professionally during the winter months in the National Lacrosse League. The Six Nations Rivermen are also undefeated. They have a perfect 10-0 record and are in first place in the OLA’s six-team Senior B circuit. Meanwhile, the Six Nations Arrows are off to a 9-1 start in their Junior A league. The Six Nations Rebels have an impressive 18-1 mark. And the Six Nations Warriors have the best Junior C record, 10-2. “For such a small community it’s a big accomplishment,” said Rich Kilgour, who is in his eighth season as serving as the Chiefs’ coach. Six Nations is the largest First Nation in Canada with about 25,000 members. About half of those members live in the First Nations’ community of Ohsweken. Kilgour believes there are a couple of reasons why Six Nations squads are lacrosse powerhouses. “I think the big thing is that they have a year-round lacrosse arena,” he said. The Iroquois Lacrosse Arena is located just outside of Ohsweken in Hagersville. The facility opened in 2004. Kilgour is at the ILA year-round as he is also an assistant coach for the NLL’s Buffalo Bandits. The Bandits stage some of their practices at the ILA. “There are kids there every day,” he said. Kilgour believes those from Six Nations should also be boasting of the fact the majority of those players on Junior and Senior rosters are from the community. Though various Six Nations clubs have won provincial and national titles over the years, the most successful season as a group was in 2014. That’s when the Chiefs, Arrows and Rebels all captured national championships. And the Rivermen placed second at their Canadian tournament. Kilgour does not want to speculate on whether Six Nations squads will continue their early-season winning ways and go on to bring home national titles. But Jake Henhawk, the Arrows’ general manager, is confident enough to go on the record and state Six Nations clubs are capable of winning four national crowns this season. There is no national Junior C championship so the Warriors can only conclude their season with a provincial title. Henhawk said those from Six Nations are not surprised with how their teams are faring this season. The Chiefs are the defending national champs, having won the Mann Cup at home this past September. If they defend their Ontario title, however, they will travel to British Columbia this year to square off against the Western Lacrosse Association champs, who will host this year’s Mann Cup. The Rivermen, who captured their national title, the Presidents Cup, in 2015, are hoping to qualify for and win their Canadian tournament, which will be staged in Owen Sound, Ont. 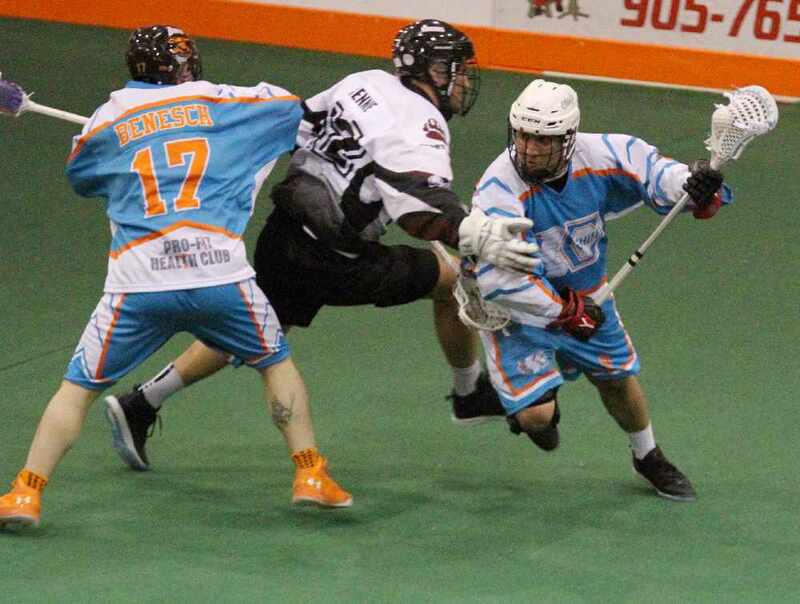 The Arrows, back-to-back winners of their national Minto Cup tournament in 2014 and ’15, are keen to add another Canadian crown to their list of accomplishments. This year’s Minto Cup tourney will be held in Brampton, Ont. And the Rebels, who last won their national Founders Cup in 2014, will be hoping to advance to and take top honours at their Canadian tourney, which will be held in Saskatoon. Six Nations also has another Senior B club, the Slash. It is the only Canadian entry in the 10-team Can Am Lacrosse League. All the other entrants are from the state of New York. The Slash is off to a 5-3 mark this year, good for fifth place in its overall league standings. The Can Am champs also advance to the Presidents Cup tournament.